Sankofa's boys' basketball team celebrates its state championship at the Giant Center. HERSHEY, Pa. — After celebrating on the court at the Giant Center on Thursday afternoon, the Sankofa basketball team patiently laid in wait for coach Isaiah Thomas to return from postgame interviews. Well, as patiently as a group of happy teenagers — who just won their school’s first PIAA championship — could wait to douse their coach with water. NCAA Tournament: Which former Philly high-school stars are part of March Madness? The team’s first attempt was thwarted on the court by assistant coach Ameen Akbar, who leaned his left elbow atop the cooler after sensing the plot and realizing water on the hardwood with less than a minute left wouldn’t have been appropriate. When Thomas, the only basketball coach the 10-year-old school has ever known, finally arrived in the locker room after the Warriors overpowered Vincentian Academy, 83-61, for the Class A title, his team, most with cell-phone camera recording, had to wait just a little longer. So, the Warriors walked into the hallway of the Giant Center, championship trophy and oversized chocolate bar in tow, and posed as a team in front of the PIAA signage. After the players retreated to the locker room, a “where is Zeke” chant broke out. When Thomas finally arrived, water wasn’t far behind. 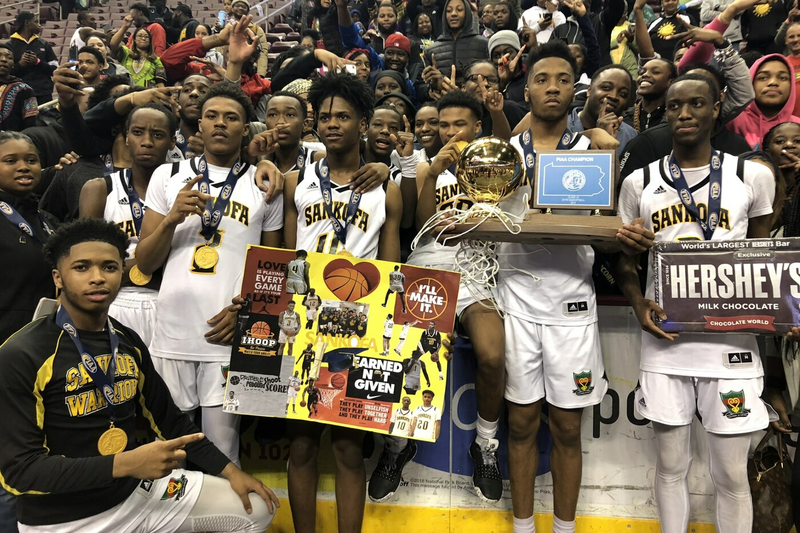 Thus is the story of Sankofa’s first state championship run, one that began with an impatient, inconsistent team that evolved into a poised, patient, and devastatingly efficient champion. “Congratulations, y’all!,” Thomas said, dripping wet, his team screaming and cheering all around him. Sankofa (18-10) dominated Vincentian from nearly start to finish, assisting on 21 of its 34 field goals, shooting 59 percent from the field, 50 percent from behind the three-point line, and adding 15 steals and five blocked shots. All of that from a team plagued by inconsistency and impatience earlier this season. There was no cruise, only control Thursday against the District 7, No. 2-seeded Royals (20-9). Passes were aplenty on offense, while deflections came in bunches on defense. Senior forward Scott Spann led all scorers with 26 points. He also added eight rebounds and four steals. Dynamic junior wing Derrius Ward added 20 points, nine assists, and six steals. Versatile senior Khalil Turner, a Rider commit, supplied 12 points, four assists, three blocked shots, and three steals. Kobe Devine, Thomas’s nephew, added 12 points on 4-of-6 shooting from three. Ward, a 6-foot-5 jumping-bean, authored the best play that didn’t count: an emphatic one-handed dunk negated by an offensive foul. The Warriors led, 21-10, after the first quarter, 45-24, at intermission and 63-36 heading into the final frame. The Warriors’ average margin of victory in the four-game stretch during Class A play: 36 points. S: Scott Spann 26, Derrius Ward 20, Khalil Turner 12, Kobe Devine 12, Canaan Boswell 5, Kiko Hall 2, Tyrell Livingston 2, Samir Priester 2, James Savage 2.